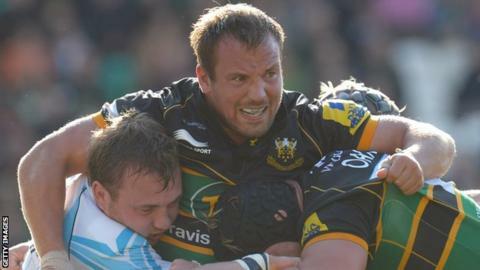 Harlequins have signed England prop Paul Doran-Jones on a two-year deal from Northampton, starting next season. The 27-year-old has made four international appearances and was part of the England team that won the Six Nations Championship in 2011. Quins director of rugby Conor O'Shea said: "Not only is Paul talented, at his age he will only get better. "He comes from a fabulous club and has been coached by one of the best forwards coaches in the country." The London club moved for Doran-Jones after Samoa international prop James Johnston confirmed he will join Saracens at the end of the season. O'Shea continued: "While we were disappointed to lose James Johnston, we recognise the need to have an experienced player to come in to supplement the existing tight-head talent we have at the club in Will Collier and Kyle Sinckler. "With that in mind we are very fortunate to be able to bring in a player of Paul's ability." Doran-Jones, who was recently named in England's 33-man squad for this year's Six Nations tournament, said he was delighted to join the current Premiership champions. "The team play with smiles on their faces, a sure sign that they enjoy their style of rugby," he said. "I'm looking forward to being part of that, to improving my game and to working with the coaches and players to contribute to further success for Harlequins. "In the meantime, I'm committed to doing my best for everyone at Northampton Saints and helping the club to a great finish to the season."